How would you like to save up to 20 percent on your annual home insurance premium? This is the estimated annual amount you could save each year by adding a home alarm system to your home security and safety tools. Some of the savings you can realize are tangible, easy to calculate, and immediately translate into money back into your pocket. Some of the savings are less immediately tangible, like peace of mind, safeguarding irreplaceable items and memories, feeling safe in your home, and also knowing your home is protected while you are away. All of these savings matter. And with the help of a home security system, you can start reaping all of the following types of home alarm system-related savings right away! Having your home or car robbed or vandalized is always heartbreaking, stressful, and unforgettable. For many homeowners, the sheer experience of having their private home space breached can cause symptoms akin to post traumatic stress disorder (PTSD) or major depression. When you add to that the anxiety and expense of having to put your life and your home back together after a burglary, the expenses start to mount. These five savings options are all available to you when you choose to install a home security system! 1. Save 5 percent just by adding a home alarm system. Just adding any type of home alarm system, no matter how basic, can often net you at least a five percent discount on the cost of your annual home insurance policy. 2. Save 10 to 15 percent by connecting that system to a central monitoring network. There are a few options today to provide you with extra safety and security monitoring inside your home for the times you can’t be at home personally to keep an eye on things. These can include smartphone-managed remote tools, closed-circuit video monitoring or connecting your system to an externally monitored central network. The latter often includes extra services, such as the option to generate a call to local law enforcement if the security alarm is tripped and unauthorized entry is suspected. You can talk with your insurance provider about which types of networking options may provide you with an extra discount or reduction on your annual home insurance premiums. 3. Save even more by adding water sensor alarms and/or video monitoring. Some insurers will provide a discount of up to 35% of the premium for water damage peril if you add a water sensor-monitored alarm. The more components of a full security system you add, the more you can save. Alarms and sensors can include an automatic message sent to your cellphone and to local authorities. With video monitoring, you can immediately see what is actually happening inside your house if a smoke detector, intruder alert, or water sensor is tripped. 4. Save 10 to 15 percent for remaining free of claims for three to five years. Sometimes the biggest win that comes from installing a home alarm system is simply by making your home a less desirable target for thieves. If you wanted to burgle someone’s home property, would you choose a house that has a “Smile! You’re on Video Camera!” sign posted out front or a house that has no sign? You would probably pick the house that looks easier to get in and out of without being detected, right? This is why even the simplest home alarm system can end up being an effective tool to deter criminals. This is also why many home insurance providers are willing to offer homeowners a reduction in premiums for installing home alarm systems! 5. Save on depreciation costs for replacement of lost, damaged, or stolen items that have devalued or are simply irreplaceable. Depending on how your home insurance policy is structured, you may have reimbursement of lost, vandalized, or stolen items based on their replacement cost, or you may have coverage only for their actual cash value. If you have an insurance policy that reimburses based on actual cash value, you should know that most items are reduced in value (they depreciate). Keep in mind that even if your home contents are insured for their replacement value, some things in the home may not be. For example, if you have a car parked in an attached garage, that car is covered on its own vehicle policy, not on your home policy. Most car policies do not provide replacement cost coverage if someone breaks into your home and steals or vandalizes your car. Having an alarm can deter would-be thieves and protect things like your car. By making your home less desirable as a target for thieves, you increase your chances of never having to file a loss or damage claim against your home insurance at all! Not only will this keep your most cherished items safely in your possession, but it will also net you the additional savings described here, depending on how your insurance provider’s safety discounts are structured. 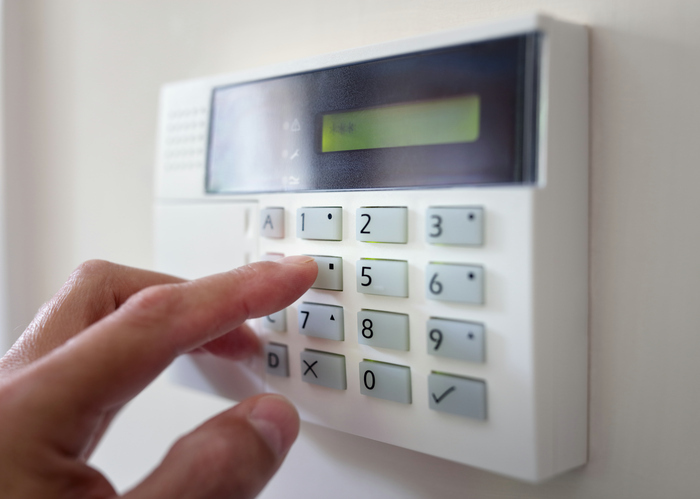 Mackay Insurance’s Founder, the Late David Mackay, Recommends Home Alarm Systems! Did you know that Mackay Insurance’s founder, the late and much-missed David Mackay, kept a home alarm system for many years and credited it with keeping his household safe and improving his own peace of mind? Here at Mackay Insurance, we keep David Mackay’s legacy alive by keeping premiums affordable and customer service top-notch! Today, Mackay Insurance has grown from a small local firm with just 35 clients to a regional brokerage serving the insurance needs of more than 5,000 residential and commercial customers! Give us a call at 1-888-853-5552 or visit us online to get a free estimate on our insurance products!